There are some sure enough horse traders on the board. I like horse traders. Good people. Here is the results of what I do with real maple syrup and Coho salmon a couple members fixed me up with. Won't mention names but you know who you are and I appreciate you. Though I don't know squat about salmon nor maple syrup I hope I've done the syrup and salmon justice. Thanks again. Gonna have the whole family here for Easter and I believe this maple syrup smoked salmon is going to be a hit - assuming it lasts till Easter. Looks great! Sure would be difficult to stay out of in this house. Its pretty tasty. I've caught myself nibbling at it a time or two. I LOVE LOVE LOVE smoked salmon! I brine the salmon in brown sugar, salt and pepper for around 12 hours. Then rinse and pat dry. I put it in my smoker at 220 and it takes about an hour to get the salmon to 140. It almost never gets cold, since the family devours it. I have never tried the maple syrup, what is the recipe? I used Hank Shaw's recipe. The only thing I did differently was I cold smoked them in apple wood for a few hours first then followed his procedure which is similar to what you do. I don't eat much salmon so I don't have a lot to compare this to but IMO its pretty darn good. Having been raised on salmon about 6 days a week I find smoked salmon about the only way it is palatable. But good fresh smoked Coho, Chinook, or Sockeye done right is very good. You look like an old pro with that smoked salmon! Looks great, I have a few fillets left in the freezer may have to try that recipe! Everyone seemed to love it for Easter. Jogeephus wrote: There are some sure enough horse traders on the board. I like horse traders. Good people. Here is the results of what I do with real maple syrup and Coho salmon a couple members fixed me up with. Won't mention names but you know who you are and I appreciate you. Though I don't know squat about salmon nor maple syrup I hope I've done the syrup and salmon justice. Thanks again. 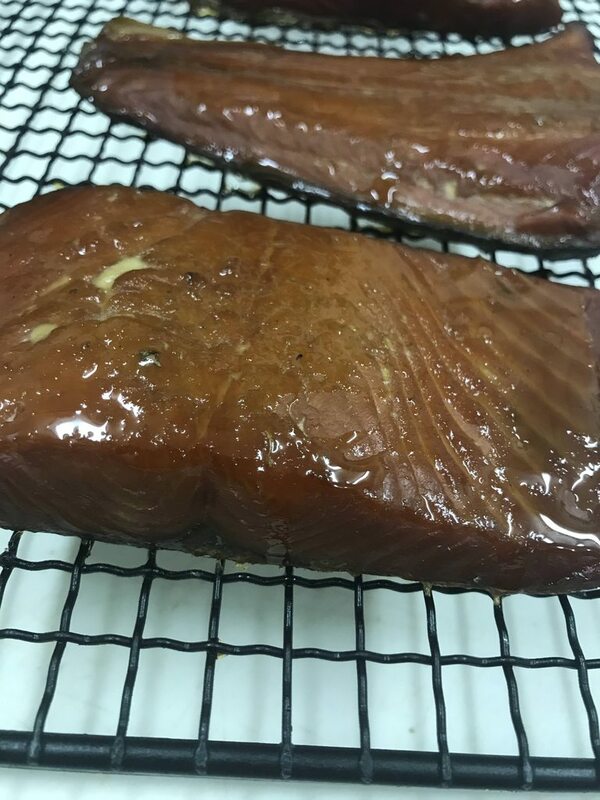 Gonna have the whole family here for Easter and I believe this maple syrup smoked salmon is going to be a hit - assuming it lasts till Easter.